Are you looking for something to do that is a little unusual? If you are looking for an activity that is good for the environment and has business potential-worm farming may be for you. Were you aware that an earthworm can lay nearly 900 eggs each year? That’s a lot of eggs! Their gastrointestinal tract helps neutralize acidic soil or soil with a high alkaline level. Gardener’s really like the soil that worms produce. Other animals eat worms-nice diet huh? A natural food that is safe and healthy. So, how could you go wrong with a good worm farm? An interesting and strange thing to know about worm farming is that long ago Cleopatra declared earthworms to be sacred, gods of fertility. A little old earthworm was protected and cherished, death to the person who caused harm to the earthworm. Of course in the United States today the earthworm doesn’t get that form of respect. 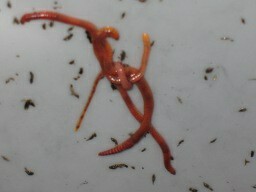 Most of the time the worm is used as bait, thought to be “icky” or simply forgotten about. Some other cultures use it for food, which could be considered sacred to a starving person! Worms are good to eat if you are trying to lower your cholesterol level. Seriously, earthworms can reduce your cholesterol level because they contain Omega 3 oil. You may be saying that you’d rather have a high cholesterol level. Consider some of the other things that you eat. To a vegetarian, meat eaters are the sick people. Someone that eats meat might not understand how someone can live by eating only vegetables. Perhaps eating worms isn’t so crazy after all! Worms do contain protein, are very lean, and are inexpensive to farm. If you prefer a sophisticated term for this oddity, its scientific term is entomophagy. In the United States worm farming isn’t done to produce human food, however they are raised for other reasons. Those worms in the bait shop or in the pet store need to come from somewhere. Now you know where they came from. 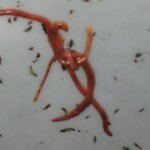 All businesses have risks associated with them, worm farming is no exception. There is some work involved in building a productive worm farm. Feeding your worms doesn’t cost much for a small worm farm. Worms will eat fruits and vegetables, newspapers, grass clippings and leaves. Just make sure that anything you feed them has no residues of any sort of poisons. The easiest worm farm is a container with some dirt, air holes, newspaper bedding and some food scraps. A larger worm farm needs a method to separate the worms from the castings after the worms have done their thing. The liquid that is produced can be diluted and used to water your plants. Try starting a small worm farm to see if it is something that is of interest to you before you try to become a mega worm farmer.